One of those days that you need quick and easy magic happening in the kitchen – perfect for this super easy pasta recipe. All you need to do is cook pasta, blend the rest of the ingredients and combine – voila! Also perfect for a quick meal-prep on a Sunday evening or when you are simply craving some good old pasta. 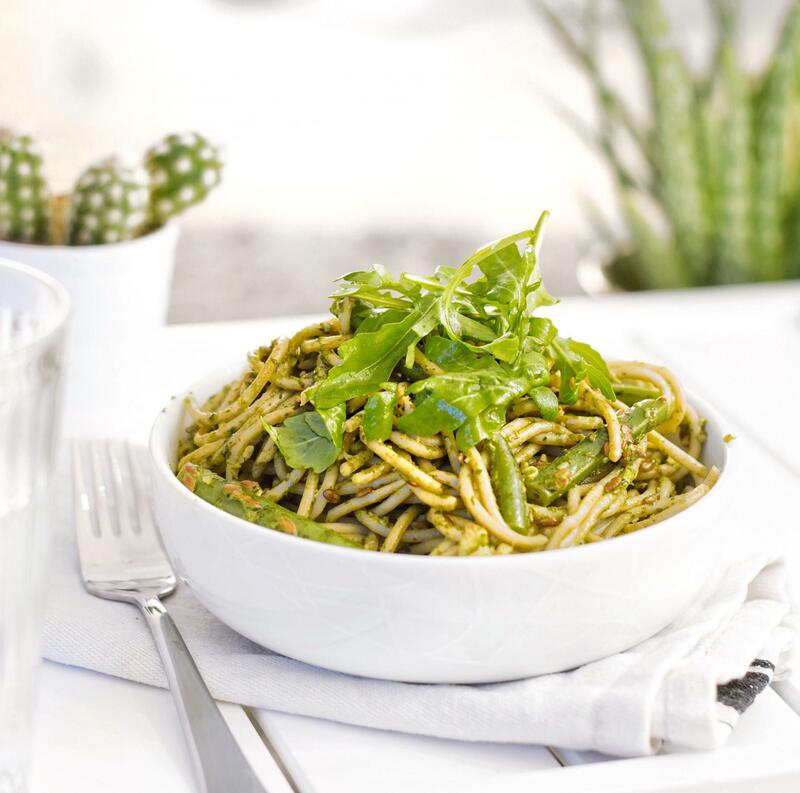 Here my go-to vegan pesto recipe for these easy-peasy-pasta! Cook your spaghetti according to the packaging instructions. After 5 minutes in boiling water, add the green beans to the pasta water and cook them for a further 4-5 minutes. Add all pesto ingredients to a blender or small food processor and blend until a smooth paste develops. Mix pasta, pesto and the pasta water well until everything is well combined. Toss the rocket salad with a little Balsamic Vinegar and oil and use them as a topping for your pasta dish. Do you have a super-delicious, favourite pesto recipe that you would like to share? Let me know in the comments below – always happy to try out new pesto combinations! Are you already following my Instagram account? More recipes + photos are posted there on a regular basis, so don’t miss out!